University of Iowa leaders announced the renewal of a $21 million grant of a Clinical and Translational Science Award (CTSA) from the National Center for Advancing Translational Sciences at the National Institutes of Health (NIH). Faculty and staff in the UI Carver College of Medicine, the UI colleges of Public Health, Nursing, Liberal Arts and Sciences, and the Tippie College of Business will use the grant to expand the university’s research efforts beyond its borders to collect data from people in their home communities across the state. In a one-on-one interview, Pat Winokur, MD, describes the features to be implemented statewide with the CTSA grant renewal. Winokur and ICTS co-director Jeff Murray, MD, professor of pediatrics, say this research approach could be very important for those in rural settings, though they think these strategies are useful for all patients and research volunteers throughout the country. At the same time, the grant provides infrastructure for researchers to use data from electronic medical records and develop better strategies for enhancing clinical and translational research. 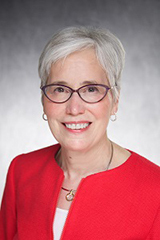 “This is a critical opportunity to not only collaborate with all types of health providers, nurses, physical therapists, pharmacists and physicians, in bringing research findings to Iowa and elsewhere, but to also involve those providers and their community members in doing those studies and making those research advances,” Winokur added. The April 3 announcement marks the third renewal of the original 2007 CTSA grant. UI leaders point out that funds can only be used to pay for activities that are listed in the grant. Studies show that research funds that come to Iowa have a powerful effect that boosts local economies throughout the state. The UI Carver College of Medicine and other UI health science colleges train 53 percent of physicians, 82 percent of advanced practice nurses, 51 percent of pharmacists, 77 percent of physician assistants, and 78 percent of dentists who practice in Iowa. Four out of every 10 Iowans live in rural parts of the state. Funding for the grant will be provided through 2023.